The most detailed case information is often in an attachment found toward the bottom of the page by clicking the ‘View Attachment’ button. The attachment will be a pdf (viewed with Adobe Acrobat Reader) or tif (viewed with Microsoft Office Document Imaging). November 08, 2016 ; 301 W. 2nd Street, Council Chambers, 6:00 PM. The Planning Commission meets regularly on the second and fourth Tuesdays of every month, acting as the City of Austin’s Land Use Commission for areas with a neighborhood plan or an initiated neighborhood plan. Hearings may be postponed by the Planning Commission, city staff, or by the applicant for a variety of reasons. If the commission sets a new hearing date at the time the postponement is granted, re-notification may not be required. Contact the Case Manager with any questions. During the week of 10/5/15, Manifold Real Estate (for Alcove Storage) distributed flyers throughout the Ridgetop neighborhood inviting neighbors to attend a presentation on 10/13/15 at Red River Church. On 10/13/15 Alcove Storage Project staff gave an open presentation to the Ridgetop neighborhood residents, with a Q/A on project details. Seven near neighbors to the project and 3 RNA officers attended. project height changed from 3 stories facing I-35 and 2 stories on Harmon to 4 stories facing I-35 and 3 stories on Harmon Ave.
Use would be short term, boutique office space on the ground floor with climate controlled general storage and wine storage in the remaining space. No food establishments, liquor, beer or wine sales. Manifold Real Estate has obtained a 60 year lease on the land and anticipates beginning construction Summer 2016. Manifold seeks a letter of support from the Ridgetop Neighborhood Association for an expansion of the conditional use to include this hybrid use of light office and air conditioned storage. Although some key items of the project changed from the initial drawings posted in October on the RNA website, the general esthetics remain very similar for the building and landscape, setbacks, hours, lighting, security, and placement on the site. In discussions with residents and during the 10/13/15 meeting. No strong objections were heard and general support of the project was seen as long as the project as described does not change substantially from the presented vision and esthetics on 10/13/15 to RNA. Should the proposed project features or esthetic change with the submission of the site plan to COA or COA requests changes, we are requesting that Manifold/Alcove project staff meet again with RNA officers to review the changes and reconfirm support. This is a critical extra step to any letter of support as this building is large, very close to single family homes, and is a cornerstone to the 51st street gateway to the neighborhood. We are providing a short comment period. If no strong objections are communicated, we will proceed with next steps for a letter of support. 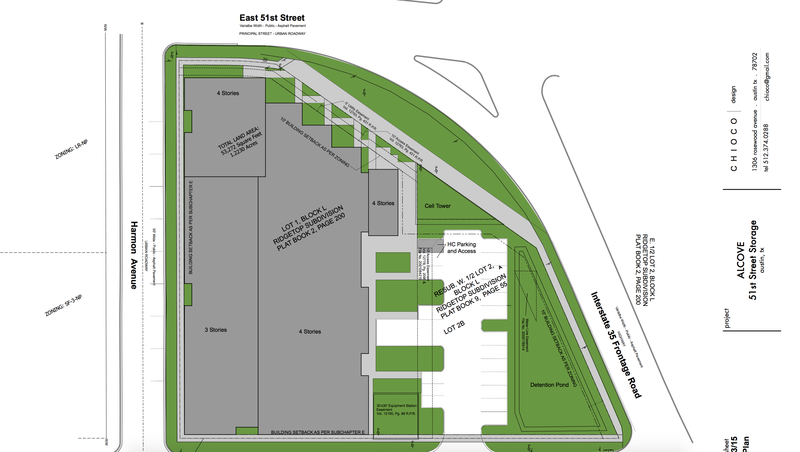 Parking – will be along I-35 frontage road with only entrance into complex from 50th Street. Traffic – In and out access along 50th street. Hoping for minimal traffic impact from storage use; storage is among the lowest trip generators of any commercial use.